Stone Mountain Park is Georgia’s #1 tourist site. It is a quartz monzonite dome monadnock and the largest piece of exposed granite in the world. 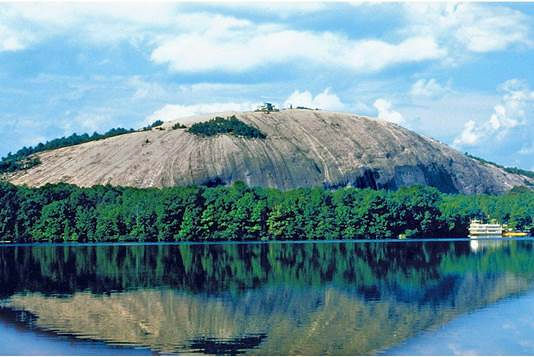 Stone Mountain was once owned by the Venable Brothers and mined for its granite for global use. Stone Mountain is well known for not only its geology, but also the enormous rock relief on its north face, the largest bas-relief in the world. The dome of Stone Mountain was formed during the formation of the Blue Ridge Mountains around 300–350 million years ago (during the Carboniferous period), part of the Appalachian Mountains. It formed as a result of the upwelling of magma from within the Earth's crust. This magma solidified to form granite within the crust five to ten miles below the surface. It was purchased by the State of Georgia in 1958"as a memorial to the Confederacy." Stone Mountain Park officially opened on April 14, 1965 – 100 years to the day after Lincoln's assassination. It is the most visited destination in the state of Georgia.